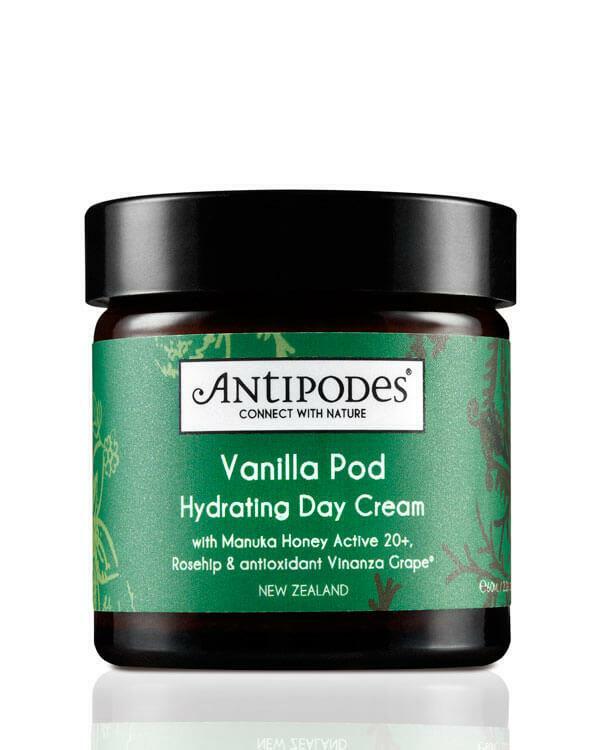 The Vanilla Pod Hydrating Day Cream from Antipodes! Revolutionary antioxidant Vinanza Grape from Marlborough sauvignon blanc grape seeds keeps your skin healthy and energised. Native New Zealand manuka honey has potent anti-blemish properties to help keep skin clear and fresh. Meanwhile, rosehip’s high levels of Vitamin A and C and essential fatty acids help reduce the appearance of scars and wrinkles! Discover the scientifically validated ingredients and formulations in the Vanilla Pod Hydrating Day Cream that enhance your skin to function naturally, feel better and look its beautiful best. The Vanilla Pod Hydrating Day Cream is certified vegetarian by the UK Vegetarian Society, a globally respected organisation for the assessment of vegetarian status. Apply the Vanilla Pod Hydrating Day Cream from Antipodes at sunrise by gently massaging across face, neck and cleavage. Use after your cleanser, toner and favourite Antipodes serum. Suited to most skin types. Ingredients: Aqua (water), Butyrosperum parkii (shea butter), Squalane (vegetable), Leptospermum scoparium mel (manuka honey), Persea gratissima (avocado oil), Macadamia ternifolia (macadamia oil), Rosa canina (rosehip oil), Glyceryl stearate, Ceteareth-20, Ceteareth-12, Cetearyl alcohol, Cetyl palmitate (natural source), Lecithin (vegetable), Tocopherol (vitamin e), Macropiper excelsum (kawakawa leaf), Vanilla planifolia (vanilla oil), Citrus nobilis (mandarin oil), Citrus grandis (grapefruit seed extract), Iodopropynyl butylcarbarmate, Phenoxyethanol. Ik kende deze al en ben enorme fan van dit merk. Heel goed voor de droge wat oudere huidjes. Blij dat jullie dit merk verkopen!